Personal, Social and Emotional development-This week we joined the rest of the school for the Monday assembly and were learning about Remembrance day and why it is important to us. The children learnt about what a poppy symbolises and we have continued this by thinking about the people that are important to us and why. Today we carried out a two minute silence and talked about why this is important to do. Communication and Language-We have enjoyed learning to tell the story of ‘Jack and the beanstalk’ this week, particularly focusing on using expression and actions to help us remember key parts of the story. When we first told the story there were lots of words that we came across that we were unsure of. The children are really good at identifying these words now and putting them on our traffic lights or word of the week wall. Once we were familiar with the story we worked with partners to think of words to describe the different characters in the story. I was really impressed with the words that they came up with and we then used these to help us create an image of the characters for our paintings. Physical development-This week used our story as inspiration. Initially we told the story actively and then thought about the ways in which the different characters moved and how we could move our bodies like a giant or like Jack when he climbed up the beanstalk. We have also continued to work on developing our fine motor control and in particular our pencil grip. Literacy-This week we have focused on our sounds of the week and the sounds that we already know. Our focus has been to correctly identify the sounds and then form the letters correctly. You may have also noticed the children’s latest piece of writing on our writing working wall. Following on from our firework topic last week we wrote about all the things that we had seen or heard on bonfire night. It is great to see the children’s writing progressing and if you flick through their writing on the board you can see the progress they are making. Our main target now is to use the letters we are learning in our writing and in particular to hear and then form the first sound of a word correctly. Please could you continue to support your child with writing their name, remembering that they need a capital letter for the first letter and then lower case letters. Maths-We have been busy measuring this week. This links with our Jack and the beanstalk, we measured ourselves and compared height, seeing who is the tallest and who is the shortest. 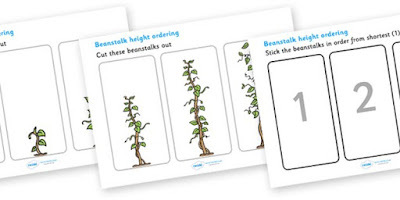 We have also been looking at different sized beanstalks and ordering them by size. With this we have been using all the mathematical vocabulary associated with size. Expressive art and design- This week we have been busy creating art work inspired by Jack and the beanstalk. On Thursday we made a giant beanstalk to go on the wall, which we then used to measure our height. We finished the week by creating our own paintings of the different characters and parts of Jack and the beanstalk. For this the children had to use their imagination to describe and then create a painting of what they imagined the characters to look like. Understanding the World-Our understanding of the World has linked with our Personal, social and emotional development this week. We have been learning about Remembrance day and why we wear poppies to show our respect. To continue this we related it to our own lives and thought about the people who are important to us and how we can show them that they are a valuable part of our lives. Phonics workshop-Apologies for cancelling the phonics workshop at short notice. It will now run on Tuesday 15th at 2.30pm. This is a really important workshop and it would be great to have as many parents as possible attending. Extreme read-Please, please send in your extreme reading photos. At the moment we only have about six and we need at least one from each child and parents if possible so that we can create a display. Thursday-Mrs Bruce will be teaching the class all day. Literacy: Jack and the beanstalk. This week we have been comparing the size of objects and ordering them by height. At home you could: * See who is the tallest in your family. * Collect some different objects and then order them by height or length. You could take a photo of your family in height order or bring in different sized objects that you have ordered by size. Don’t forget to bring in your extreme reading photos of you and your family.